Automation Anywhere, as with the RPA market in general, continues to grow rapidly. The company estimates that it now has 1,600 enterprise clients, encompassing 3,800 unique business entities across 90 countries with ~10,000 processes deployed. At end 2018, the company had 1,400 employees, and it expects to have 3,000 employees by end 2019. The company was initially slow to go-to-market in Europe relative to Blue Prism and UiPath, but estimates it has more than tripled its number of customers in Europe in the past 12 months. Automation Anywhere is positioning as “the only multi-product vendor”, though it is debatable whether this is entirely true and also whether it is desirable to position the various components of intelligent automation as separate products. Nonetheless, Automation Anywhere is clearly correct in stating that, “work begins with data (structured and unstructured) – then comes analysis to get insight – then decisions are made (rule-based or cognitive) – which leads to actions – and then the cycle repeats”. Automation Everywhere clearly sees the current RPA market as a land grab and is working hard to scale adoption fast, both within existing clients and to new clients, and for each role within the organization. The company has traditionally focused on the enterprise market with organizations such as AT&T, ANZ, and Bank of Columbia using 1,000s of bots. For these companies, transformation is just beginning as they now look to move beyond traditional RPA, and Automation Anywhere is working to include AI and analytics to meet their needs. However, Automation Anywhere is now targeting all sizes of organization and sees much of its future growth coming from the mid-market (“automation has to work for all sizes of organization”) and so is looking to facilitate adoption here by introducing a cloud version and a Bot Store. The company sees reduced “time to value” as key to scaling adoption. In addition to a Bot Store of preconfigured bots, the company has now introduced the concept of downloadable “Digital Workers” designed around personas, e.g. Digital SAP Accounts Payable Clerk. Automation Anywhere had 14 Digital Workers available from its Bot Store as at mid-March 2019. These go beyond traditional preconfigured bots and include pretrained cognitive capability that can process unstructured data relevant to the specific process, e.g. accounts payable. In addition, Automation Anywhere believes that to automate at the enterprise-wide level you have to onboard your workforce very fast, so that you can involve more of the workforce sooner. Accordingly, the company is providing role-based in-product learning and interfaces. An IT user can learn about and manage user management, including roles and privileges, and license management. Availability in 4 course languages. An increased emphasis on channel sales is also an important element in increasing adoption, with Automation Anywhere looking to increase the proportion of sales through partners from 50% to 70%. The direct sales organization consists of 13 field operating units broken down into pods, and this sales force will be encouraged to leverage partners with a “customer first/partner preferred” approach. Private Equity. Automation Anywhere has set up a PE practice to go after the more deterministic PEs who are very prescriptive with their portfolio companies. In addition, Automation Anywhere is now starting to target ISVs. The company has a significant partnership with Workday to help the ISV automate implementation and reduce implementation times by, for example, assisting in data migration, and the company is hoping that this model can be implemented widely across ISVs. 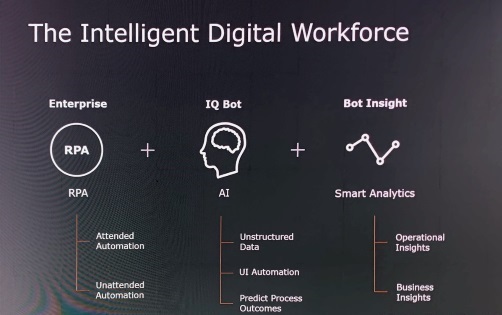 Automation Anywhere is also working on a partner enablement platform, again seen as a requisite for achieving scale, incorporating training, community+, etc. together with a demand generation platform. Customer success is also key to scaling. Here, Automation Anywhere claims a current NPS of 67 and a goal to exceed the NPS of 72 achieved by Apple. With that in mind, Automation Anywhere has created a customer success team of 250 personnel, expected to grow to 600+ as the team tries to stay ahead of customer acquisition in its hiring. All functions with Automation Anywhere get their feedback solely through this channel, and all feedback to clients is through this channel. In addition, the sole aim of this organization is to increase the adoptability of the product and the organization’s NPS. The customer success team does not get involved in up-selling, cross-selling, or deal closure. “Available Everywhere” encompasses both a technological and a geographic perspective. From a hosting perspective, Automation Anywhere is now available on cloud or on-premise, with the company clearly favoring cloud where its clients are willing to adopt this technology. In particular, the company sees cloud hosting as key to facilitating its move from the enterprise to increasingly address mid-market organizations. At the same time, Automation Anywhere has “taken installation away” with the platform, whether on-premise or on cloud, now able to be accessed via a browser. The complete cloud version “Intelligent Automation Cloud” is aimed at allowing organizations to start their RPA journey in ~4 minutes, while considerably reducing TCO. In terms of languages, the user interface is now available in eight languages (including French, German, Japanese, Spanish, Chinese, and Korean) and will adjust automatically to the location selected by the user. At the same time, the platform can process documents in 190 languages. Automation Anywhere also provides a mobile application for bot management. In summary, Automation Anywhere regards the keys to winning a dominant market share in the growth phase of the RPA market as being about simultaneously facilitating rapid adoption in its traditional large enterprise market and moving to the mid-market and SMEs at speed. The company is facilitating ongoing RPA scaling in large enterprises by recognizing the differing requirements of business users, IT, and developers, and establishing separate UIs to increase their acceptance of the platform while increasingly supporting their need to incorporate machine learning and analytics as their use cases become more sophisticated. For the smaller organization, Automation Anywhere has facilitated adoption by introducing free trials, a cloud version to minimize any infrastructure hurdles, and a Bot Store to reduce development time and time to value.